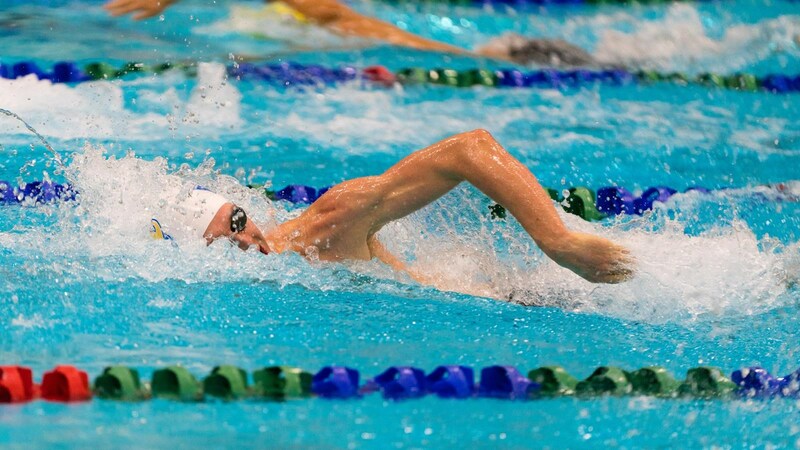 VICTORIA – It was a golden day in the pool today for University of Victoria Vikes swimmers Eric Hedlin and Danielle Hanus at the Canada West Swimming Championships hosted at the University of Calgary Aquatic Centre. The UBC Thunderbirds topped the team leader board in both the men's and women's standings after Day 1 of three. Fourth-year Vikes swimmer Hedlin earned his third-straight Canada West gold in his specialty race, the 1500-m freestyle. More well-known for his open water swimming at the international level, Hedlin has been a force to contend with in this event the past four seasons. At the 2018 championship Hedlin touched for gold in 15:28.11 ahead of UBC's Hau-Li Fan and Calgary's Peter Brothers. Vikes team mate Ethan Phillips was fourth in 15:46.88, while Josh Zakala was seventh in 15:57.59. "Eric controlled the swim," said Vikes head coach Peter Vizsolyi. "He wasn't very happy with the middle of the swim but he laid back and should have just gone off by himself. Josh was out a little fast and wasn't able to sustain that." Also no stranger to the podium was third year Hanus who earned gold in the 50-m backstroke. Last year Hanus was edged off the top of the podium in this event when UBC's Ingrid Wilm broke the conference record, to leave the Newmarket, Ont. native settling for silver. Hanus was able to top the podium this year in 27.42, with Manitoba's Dora Modrcin taking silver and UBC's Olivia Ellard earning bronze. Both Hanus and Hedlin stepped on the podium again at the end of the night helping their teammates earn medals in the relay events. The women's 4x200-m freestyle relay event had Hanus starting the Vikes off. She was followed by first years Lauren Tayler and Allison Ballantyne, while fifth year Kaitlin Gervais was the anchor. The Vikes finished with a silver in 8:18.90 behind a UBC side that dominated in 8:04.16. Calgary finished third in 8:19.39. The silver medal was an improvement on last year's 2017 bronze-medal finish raced by Kara Wilson, Taylor Snowden-Richardson, Gervais and Hanus. On the men's side Buzz Mallender led off the 4x200-m freestyle relay and he was followed by Hedlin, Austin Phillips and Josh Zakala. The Vikes finished with a bronze medal in 7:29.96 behind silver medalists Calgary (7:23.44) and gold medalists UBC (7:18.73). "I thought both relays were really good and the people who weren't as strong really came through to swim good legs," described Vizsolyi. "The best swim of the night was probably Austin Phillips on the relay." In the women's 800-m freestyle Gervais finished fourth in 8:56.41 behind bronze medal winner Marit Anderson of Calgary (8:48.84). Vikes Alice Gentleman and Snowden-Richardson were eighth and ninth, respectively, while Anna Letkeman was 12th. "I also thought that Kaity's 800 was really, really great," added Vizsolyi. "Alice Gentleman also dropped 12 seconds off her 800-m time which was a highlight." Victoria's Ethan Jensen finished seventh in the 50-m butterfly, while Buzz Mallender was first in the B Final of the 50-m backstroke. Vikes rookie Jamie Hellard finished seventh in the women's 50-m breaststroke, while team mates Kara Wilson and Andrea Farmer finished 10th and 12th, respectively. Victoria' Bailey Espersen was the lone Vike to qualify for the A Final in the men's 50-m breaststroke, as he finished seventh. Vike Daniel Greer was 10th overall. The Vikes will continue Day 2 in the pool on Nov. 24 with the 50- and 200-m freestyle events, the 400-IM, 100-m butterfly, 100-m breaststroke, 200-m backstroke and 4x100-m freestyle relay. Live results are available here while sessions are streamed live at canadawest.tv.